John Wynne, chairman of the Strategic Plan Committee, opens a community workshop on what residents feel are the town's needs and wants. 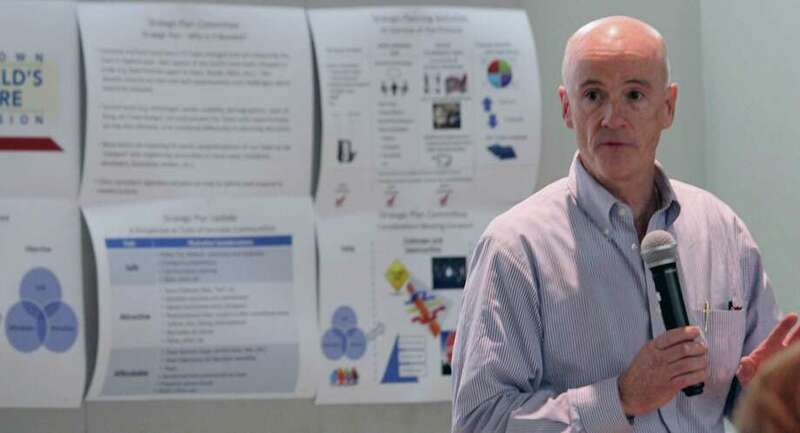 FAIRFIELD — A broader tax base, affordable housing options, traffic and climate change were raised as issues that the town needs to address, when the Strategic Plan Committee held a community forum Wednesday night. The committee, with the help of its consultants, Houseal Lavigne Associates, has been holding one-on-one interviews and small group forums since the summer, in an effort to gather feedback for the “One Town One Vision” strategic plan. Wednesday’s forum, Chairman John Wynne said, wouldn’t be the last. The goal, he said, is to “get to a place where we have Fairfield’s future mapped out.” Residents can also submit their comments to the committee via email and the town website. Wynne explained a plan needs to be created to deal with future challenges, like taxation and the economy. “If we don’t grab hold of the issues that are important to the town and take action, then whatever happens to the town, happens,” he said. But there was a complaint that there weren’t many members of the public there because no one knew about the forum and that, in the end, nothing would change because of the plan. The town’s affordability in general, and how it can attract millennials while still keeping senior citizens in Fairfield, were among the topics people said needed attention. Others cited concerns about zoning regulations and the developers they say take advantage of those regulations. After the workshops have been completed, the consultants and the committee will process all that information and return for more focus groups. The plan will address development, economic development, education, governance, fiscal spending and management, and the town’s character. “This is the highest-level plan that an entity will develop,” Wynne said, and something that other town plans — like the Plan of Conservation and Development, the annual budget, and the Affordable Housing Plan — should take direction from. Interested residents can find more information at www.hlplanning.com/portals/fairfield.